Dialysis market size was valued at USD 80.3 billion in 2017 and is expected to witness 4.0% CAGR from 2018 to 2024. Rising prevalence of end stage renal disease (ESRD) will upsurge demand for dialysis treatments. According to CDC National Chronic Kidney Disease 2017 fact sheet, in the U.S. 118,000 individuals started ESRD treatment in 2014. Majority of them require dialysis treatment that should escalate dialysis industry growth in forthcoming years. Moreover, growing alcohol consumption in developing countries such as China and India have resulted in high incidences of kidney disorders thereby, will positively impact business growth. Growing R&D investments by key industry players such as Fresenius Kabi and DaVita will augment dialysis market growth in near future. Fresenius Kabi has focused its efforts on providing superior quality dialysis devices that helps company to emerge as key industry player. Baxter implements strategic initiatives such as R&D investment that will add improvement in dialysis devices thereby, enhancing demand for dialysis devices. However, complications associated with dialysis treatment may restrain business growth in upcoming years. Hemodialysis segment accounted for over 90% revenue share in 2017 and is projected to grow over the forthcoming years. Rising prevalence in chronic diseases in geriatric and in adult population will enhance segmental growth. Peritoneal dialysis segment is anticipated to witness lucrative CAGR of 5.1% during the forecast timeframe. 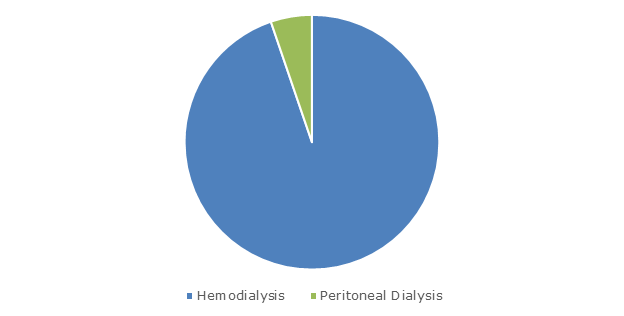 Growing preference for peritoneal dialysis in recent years due to technological advancements in dialysis devices utilized in treatment should accelerate segmental growth in coming years. Growing technological advancements in devices has increased accuracy of treatment that should positively influence business growth in upcoming years. Services segment was valued over USD 64 billion in 2017 and is estimated to witness similar trend during the analysis timeframe. Increasing demand for hemodialysis and peritoneal dialysis in treatment of chronic renal diseases boosts segmental growth. Consumables segment held significant revenue share in 2017 and is estimated to witness 4.8% CAGR over the forecast period. Increasing demand for dialysis treatment will surge segmental revenue share. Hemodialysis and peritoneal dialysis involve use of consumables such as catheters, blood tube sets and access products including IV fistula needle and vascular grafts that are used in blood purification process and help in balancing electrolyte levels in the blood. In hemodialysis, consumables are frequently demanded as these consumables cannot be reused to control complications caused due to contamination that will accelerate segmental growth. 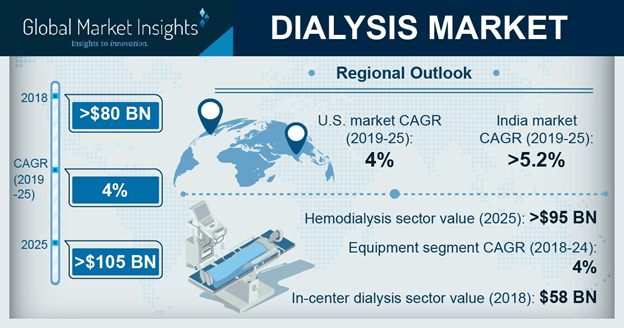 In-center dialysis segment accounted for more than 70% market share and is anticipated to have significant growth during the forecast timeframe. Increasing number of dialysis clinics globally will positively influence the business growth. According to Fresenius Kabi’s recent annual report, in 2017 the number of dialysis patients reached 3.2 million. Additionally, the company has 3,752 dialysis clinics in nearly 50 countries to support huge pool of patients suffering from chronic kidney diseases that will spur the segmental growth. Home dialysis segment will exhibit 4.3% CAGR over the analysis timeframe. The segmental growth can be accounted to high preference by geriatric population due to ease and convenience possessed by home dialysis treatment. U.S. dialysis market accounted for over 87% of regional market share in 2017 and is expected to have considerable growth during the forecast year owing to increasing prevalence of kidney failure cases. According to American Kidney Fund the Kidney Disease Statistics 2015 data, 31 million people in the U.S. have chronic kidney diseases that will thereby, enhance regional business growth over upcoming years. Moreover, favorable reimbursement policies developed by medical insurance providing companies such as Medicaid and Medicare have resolved affordability issues faced by geriatric population. Aforementioned factors coupled with shortage of kidney donors should flourish regional revenue growth in forthcoming years. India dialysis market was valued at USD 3.1 billion in 2017 and is projected to show considerable growth during the forecast period. High growth can be attributed to increasing prevalence of diabetes in geriatric as well as adult population. According to FIRSTPOST, in 2017, 72 million Indians were diagnosed with diabetes and majority of them suffered from loss of kidney function that will surge the business growth over forecast timeframe. 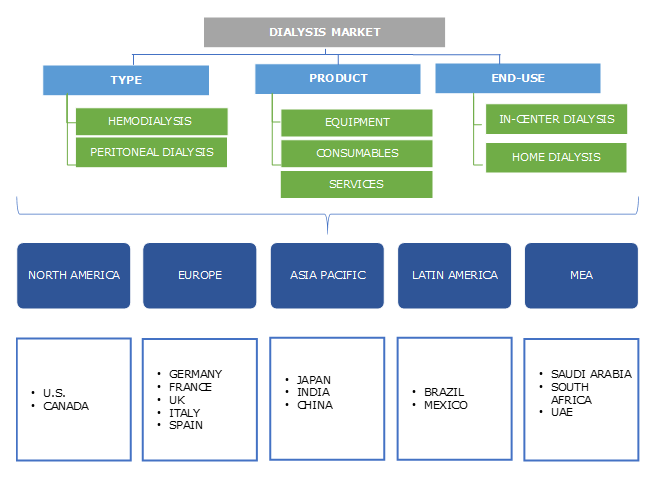 Some of the key industry players operational in the dialysis market include Asahi Kasei Corporation, B. Braun Melsungen, Baxter International, Fresenius Medical Care, JMS, Kawasumi Laboratories, Medtronic, Nikkiso, Nipro, Toray, DaVita, U.S. Renal Care, Satellite Healthcare and Rogosin Institute. These industry players implement certain strategic initiatives such as new product launch, merger and acquisitions that help them in maintaining their market position. For instance, Fresenius Kabi has developed superior quality online clearance monitors that are required for dialysis treatment. Integration of advanced technology within the dialysis monitors will increase its adoption among the doctors and clinicians that will render company with sustainable profits. The dialysis industry can be traced back to 1940’s and first dialyzer was developed by Dutch physician Willem Kolff. In 1962, Scribner established first dialysis clinic for patients. Further, Scribner also developed portable dialysis machine that provided benefits to the patients. Now-a-days key industry players have focused their R&D efforts to develop technologically advanced dialysis devices that support accurate dialysis treatment. Recently, dialyzers are made from synthetic polysulfonate and are exceptionally efficient in delivering best quality treatment. For instance, Fresenius Kabi and Baxter have implemented certain strategic initiatives such as novel product launch to enhance their product portfolio. Availability of superior quality dialyzers and dialysis devices will upsurge dialysis industry growth over the forthcoming years.